She founded and was Chairperson of Civil Rights Party/Ratz 1973-95, Member of the Knesset 1974-96. 1973-74 Minister without Portfolio for Human Rights, 1992-93 Minister of Education and Culture,1992-96 Member of The National Security Council, 1993-96 Minister of Communication, Science and Art (1995-96 Second in the Cabinet). (b. 1929-). This interview was given to Attila Somfelvi of Ynet - the Web site associated with Yediot Acharonot Israel's largest circulating daily.The Interview was translated by Sol Salbe. from the original. 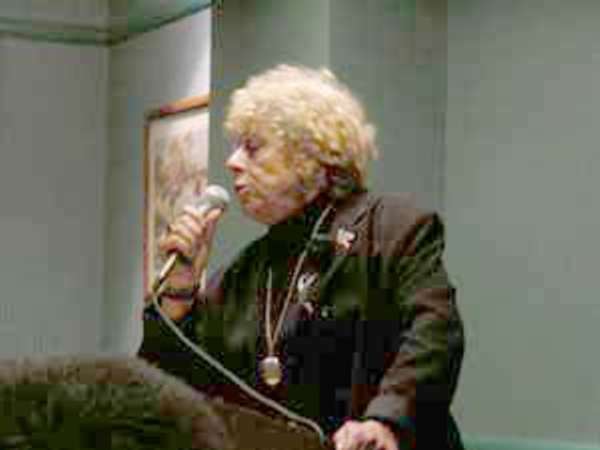 Former Meretz Leader Shulamit Aloni has established a reputation for her critique of modern Israeli society. Recently, in front of hundreds of supporters of Yossi Beilin, who had just been elected head of Yahad, Shulamit Aloni - "Oum Meretz" [The Meretz Mother (in Arabic)] - settled accounts with everyone: stylishly, sharply and in her own inimitable style. No one escaped her acerbic tongue. They all copped it: the government, apathetic Israeli society, the army and even her left-wing colleagues who have fallen asleep at the wheel. "Stop being politically correct!" she lashed out. "It's time to tell the truth to the people, straight to their faces! "Now following the election of Beilin, whom she supported, Aloni has given an exclusive interview to Ynet, explaining why she endorsed him ("he's been consistent on the issue of peace") but why she does not believe that the Left could recover anytime soon ("populists"). She warns against the disintegration of Israeli society ("gross insensitivity"), and rules out any comeback in politics ("I don't miss it") and states: "I am beginning to understand why a whole nation (the Germans) was able to say: `We did not know."" These days you meet people around the country who say: "I don't want to know, I have given up reading the papers." Do you know how many people are unwilling to read Gideon Levy and Amira Hass [Haaretz reporters in the Occupied Territories] because they simply don't want to know what is happening there? They do not deny the accuracy of these two journalists' articles, but they simply don't want to know. We have always angrily and justly rejected the Germans' claim that they "did not know". They simply didn't want to know. They worshipped the Fuehrer and their army. We also have people who do not know and do not want to know. What they know is that they must display their patriotism. And what is more patriotic than a war? So now we have the national flag and coat of arms in every classroom and we teach the students the anthem. There is even a fool [religious Likud MK Leah Ness] who proposed to write "In God We Trust " on our currency. Had she known that the Nazi army's belt carried the message: "God with us", she wouldn't have associated the Jews' God with money. But a patriotic hysteria is pervading here and people just keep quiet. building. We are pillaging the land and destroying the way of life of people who have lived in the same place for centuries. When Arik Sharon's mates had their land expropriated, they received huge compensation. Yet we are busy destroying greenhouses, plantations and the vital infrastructures of three million people, and then pretend that we are the victims. I cannot live with the fact that our sharpshooters are killing people. I cannot live with the way we continually wail that we are the victim, and do not examine our own morality. It's important to realise that appalling as suicide bombings are, aerial bombardment kills more. While we feel the pain of our 900 dead, we tend to forget that we have murdered 3000 Palestinian civilians. We are the violent ones; we are the cheats. Our very foundations have been undermined by our adulation of force, and all this is called a democracy. There cannot be democracy when we rule over three million people who have no voice. We simply have to get out of there. We do not even try to understand that what the Palestinians want is sovereignty and human rights. This gross insensitivity that you keep talking about, where does it come from? There's an absolute moral thoughtlessness that stems from the powers that be. When General [Amos] Yadlin, the head of military colleges, writes an article stating that it is moral to kill women and children while carrying out a targeted liquidation, and a moral luminary like Professor Asa Kasher endorses his view, then you have a problem. Israeli Arabs get detained at the international airport and their luggage is taken apart. There are instructions for more and more Left activists to be held up on their way abroad to force them to remain silent. Why? What is happening to us? But people remain silent as not to get into trouble. Things happen here that drive you mad. Why was there no inquiry following the death of the American protester Rachel Corrie, who was run over? Why didn't the government condemn it? Why was there no inquiry when journalists were shot, which made it OK to murder left, right and centre? The army uses sharpshooters who practise by shooting Arabs. The moral disintegration of our society is the direct consequence of what is happening in the Territories. We are responsible for the shedding of Jewish blood. What does that mean? Is somebody making sure that Jewish blood gets shed as well? In Yediot Acharonot, Nahum Barnea wrote the other day that Sharon had told him (and it wasn't only Sharon) that Jewish blood is the most efficient cement for maintaining a national consensus. When terrorism is on the wane, then people feel free to ask questions, critics can be heard and the spirit of defiance grows. There's no mileage in non-existent terrorism. I ask you, wasn't it obvious that there would be a response to our savage operations in the Gaza Strip? Everyone knew that there would be a response. Who then is responsible for the Jewish blood that is shed? We are. We with all our might continue to hit more and more. They use terrorism and we do the same, only harder. Our strategy is the strategy of force and not of reconciliation. Had we chosen the path of reconciliation we would not have stuffed up [former Palestinian Authority Prime Minister] Abu Mazen during his period in office. These days, everyone agrees that the government and army were wrong in tripping him up. But in our country we treat the army as sacred as if it were a value in and by itself that unites us and is our raison d'etre. There are many who think that it is not the state which has its army, but the army which has its state. We have just bought extremely sophisticated planes that cost umpteen billion dollars. Who needed them? We could have spent this money on health and relieving poverty. We are in peace with Egypt and Jordan. Syria is seeking peace and is no longer a factor. Iraq is not a threat and Iran is the problem of the whole world. But [Iranian-born Defence Minster] Shaul Mofaz has already jumped up and threatened the Iranians, in Persian, that he would bomb their nuclear reactor. What's he getting excited about? For the past 37 years our Jewish paranoia has been stoked by brainwashing. We get told that they want to exterminate us. Who are "they"? We are at peace with Egypt and Jordan and these two countries do not threaten us anymore. So who is going to throw us into the sea, the Palestinians? But this is the kind of paranoia that is being fostered here. The present war is not a war of survival, but a colonial war. When you say that everyone remains silent, do you include the Israeli Left? Yes. It was wrong for members of the Left to lash out against the refuseniks. In a morally degenerated state that forces women to give birth by the roadside, we ought to be praising our refuseniks instead of attacking them. But everyone wants to be careful because everyone wants to show how patriotic they are. I regard myself as very patriotic, but a true patriot is one who voices disapproval of our moral degeneration. I am told that we need to be populists; we have to be popular, grovel to the masses in order to attract them. It's easy to sway the mob There`s a tendency around the world to frown upon nationalism, but in our country we nail it to our mastheads. It's a sin committed by all the political parties. The Left is so besotted with returning to power that it is willing to adapt the Right's agenda to get there. Will the election of Yossi Beilin as head of Yahad, in reality the Left, change anything? I can't see any changes for the moment. I am out of politics and one shouldn't offer advice without accepting responsibility. I supported Yossi because he has been consistent in his struggle for peace. I do not believe that we can renew and rebuild Israeli society on the basis of liberty, justice and peace without first making peace. It's our worst, most festering wound. Do you think the Left can find a new track? I am not a believer. I do not believe anymore. I only hope that the dynamics [of the situation] will push it forward. But those dynamics will only arise when [Beilin's opponent in the ballot] Ran Cohen), Beilin and [Knesset member] Chaim Oron and the whole gang wake up. In recent times the only Meretz voices heard were those of [left- wingers] Zahava Gal-on and Roman Bronfman. But their voices were those of individuals, not of a party. I want everyone to wake up, to relate to the groups that are fighting for peace, to speak out, to attend meetings, to criticise the government. It's time we set up political stalls in the streets. One has to be daring and not be constrained by political correctness. We have to tell the truth; to state that our struggle with the Palestinians is a colonial struggle. We have to declare that what we are doing in the Territories is terrible. We have to admit that we too bombed the British people when they occupied us. We must show that we are taking money for the poor and investing it in the Territories. The minute there's an outcry on this subject, when there's criticism of resources being wasted, that's when the country will begin to change. If it were up to me, I would take the residents of [poor development towns] Dimona and Yeroham to the Territories and show them the settlers' nice houses surrounded by greenery with matching green roofs . Let them see the destruction [of the Palestinian infrastructure], the settlers-only roads and that monstrous fence. Let them see, so that they would never be able to say that they didn' t know. When they see it and remember that they haven't been paid their wages for months, they may stop voting for the Likud. Do you see yourself making a comeback in politics? obligate me to do likewise. Spain has got a 44-year-old Prime Minster. Tony Blair wasn't quite fifty when he came into power. It' s about time we let the new generation develop. Let's not cut them down. Remember what they did to Mitzna. Who is an appropriate leader: Barak, Netanyahu? throngs shouted "anyone but Shas", he did not comprehend what they were seeking. As a result we have the growth of the [secularist but redneck] Shinui. He brought disaster upon disaster on us. He never implemented the agreements [with the Palestinians] that the Israeli government had signed. He even poked fun at Netanyahu who had given [back] Hebron and boasted that in his time in office he had given nothing to the Palestinians. As for Netanyahu, I do not subscribe to his economic policy but at least Netanyahu is a man of action. Barak had nothing but words. Like a ventriloquist dummy speaking the words of its master, we heard the world's most powerful man reciting a script written in Jerusalem by one responsible for bathing the Middle East in blood for decades. This most bizarre spectacle -- Bush unable to answer a simple question, repeating key phrases like a broken automaton -- was then followed by the even more bizarre suggestion by Blair that this was not a departure from what was policy in Washington and London for decades. For those who were shocked by Bush's retreat from his own nonsense programme -- the celebrated roadmap -- let us recall the conditions that led to this creature's birth. It was Tony Blair who worked out that moving towards a political solution on Palestine may elicit Arab favour at a time most needed before the US and the UK went to war on Iraq. The plan worked. Now the roadmap is tossed like a rotten apple. Bush, reading from his new script, dubbed Sharon's plan "historic and courageous", presenting it as a fresh start in Middle East history. In Sharon's book, Bush is just another pawn. Important as he is at the moment, he serves the master plan of ridding Palestine of its people -- a result to which Sharon has committed his life's work. American presidents come and go while Sharon stands firm for decades, defeating all obstacles in his tireless, barbaric mission. With the help he now gets from Bush and Blair, he may yet complete his mission. Sharon was the one to pioneer collective punishment and mass murder in the early 1950s as the creator and commander of Israel's first notorious death squad, Unit 101. His early military career was spent in killing: not enemy soldiers but civilians in villages such as Kibyia. In Gaza during the early 1970s, he instigated a reign of terror, supposedly designed to end Palestinian resistance to the occupation. It was really another phase in his lifelong struggle to make as many Palestinians as possible flee their own homeland. He destroyed large parts of Beirut, and killed tens of thousands in his Lebanon war of 1982, in his obsessive hunt of Arafat and the PLO. As is well known, his campaigns have not been fully successful. Gaza has become the centre of Palestinian resistance and Arafat returned to Palestine after Oslo. But one of his other campaigns is about to mature: it is, of course, the grand project of settlements in the occupied territories. If there is one man who can say he is responsible for the network of settlements, numbering hundreds and housing more than half a million Israelis, it is Ariel Sharon. As minister in whatever ministry he served, he only had one agenda and single-minded priority: to enlarge the settlements and strengthen them, surround all Palestinian towns and villages with roads which dissect their land yet are closed to them; with roadblocks cutting off village from village, farmers from their lands, workers from their jobs, water from habitations, children from schools and patients from hospitals. Four million Palestinians are living in total isolation in conditions that resemble more and more those experienced by Jews in ghettoes under Nazi control. The constant battering of Arafat in Ramallah, the death sentence declared, now delivered, against all Palestinian leadership, the Apartheid wall, and now the Bush declaration where the settlements emerge fresh and clean-smelling, have all been phases in the Sharon project of closing all options for Palestinian life and existence. The aim here is not to get rid of the resistance to occupation, but to inflame the situation constantly, until a "final solution" to the Palestinian "problem" can be initiated. The continued resistance only fuels the Sharon fire: he will hit at the Palestinians come what may, but the resistance helps him to get Bush and Blair on board and to get credit for a plan which is against every tenet of international law. In the sickening climate of fear that has now engulfed the US and the rest of the West, the damage that such moves will inflict on the rule of international law is not even being considered. Neither are comments by Arab or Palestinian voices. Both failures are signs of the political disease that took hold in the West, infecting its societies. The reign of terror and unreason hailed by Bin Laden has only been accepted and enhanced by Bush and Blair, not to mention Sharon. The Bush move is likely to embolden Sharon further into ever-increasing attacks on Palestinian life, gradually but surely leading towards the goal to which he dedicated his life. The next stage for Sharon is the physical removal of most, if not all, Palestinians from their homeland. Currently, the unlawful military control of the territories occupied in 1967, made Kosher by Rabbi Bush, gives Israel over 90 per cent of Palestine. In that area lives just over five million Israeli Jews while four million Palestinians are consigned to a ghetto encompassing less than 10 per cent of their own country. But that achievement is not enough for Sharon. The next stage is "transfer" -- the ethnic cleansing of Palestinians. Bush and Blair's support for this man of blood brings such a moment closer. While Sharon is a master in breaking international law, he would have never got away with it without the backing and support of the most powerful nation on earth, with the UK holding its train slavishly. The responsibility for the blood, misery and global mayhem that Sharon is yet to cause will be shared by those who have enabled his criminal actions, and by those who stood by and let it happen. * The writer is an Israeli academic working at the University of East London. He is the co- editor of The Gulf War and the New World Order , published by Zed Books.